The Childwood Play Private Limited provides an array of institution's infrastructure and services in keeping with its customer-centric focus on creating value. Our lineup includes European standard classroom furnitures, indoor/outdoor play equipments and stations and kids/adult gym equipments. 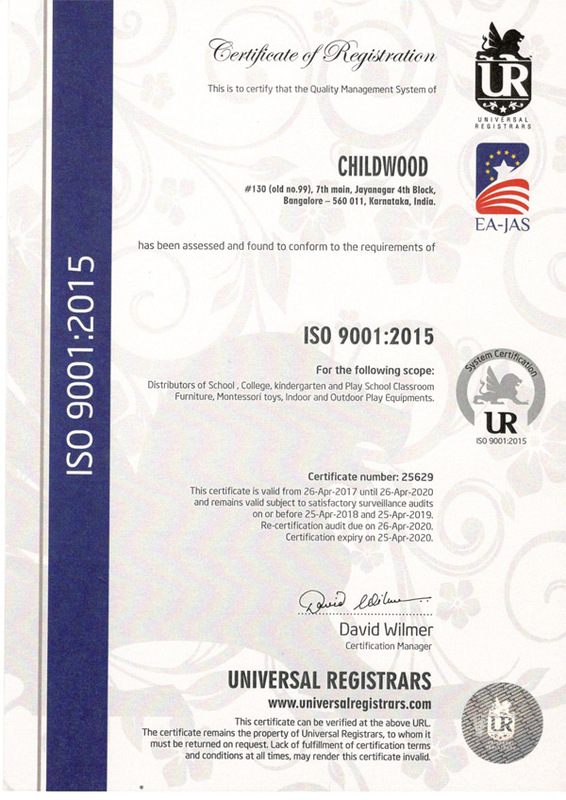 Childwood, an ISO certified company incorporated in 2009, is an Indian market leader for Classroom furniture, Indoor/Outdoor Play Equipments & Kids/adults gym equipments, having a customer Base of 1500+ across India with the entire product range of European standard with no compromise in quality and finish. We provide solutions to have the right set-up. Our motto is to make the customer aware of not just what we are into but what type of products we are into having the latest global technology for organizational needs. In fact our products follow all national and international norms of the toy/furniture industry. Our products are brilliantly designed and recognized for their value of giving excellent opportunities for learning process, fun time and experiencing creativity. Our organization is customer oriented, and all our endeavors are directed towards offering products of high quality. With the understanding of parents' concern for safe and effective products that enhance the intellect of their child, we offer products that are in compliance with user requirements. We ensure that the products are at par with international quality standards. Our professionals regularly engage in interaction with our clients to understand their needs and modulate the range accordingly. The wide distribution network ensures that the products reach our clients within stipulated time frame and in a hassle-free manner.